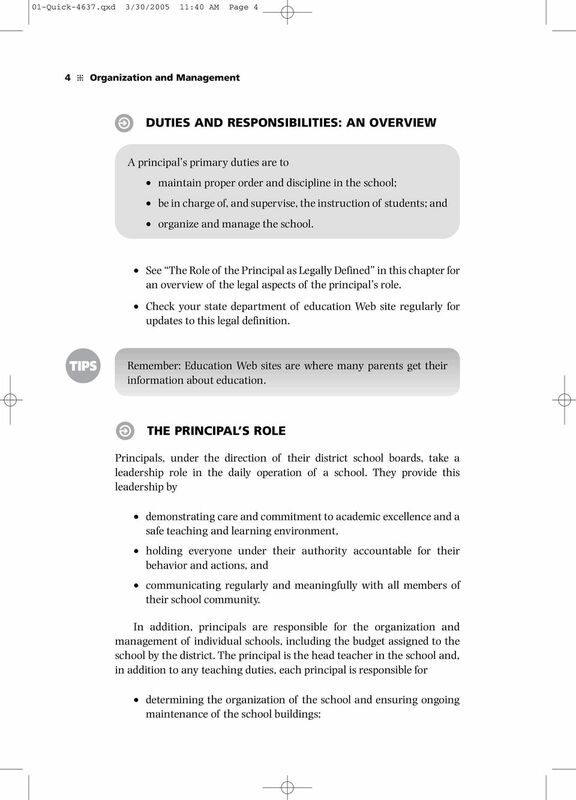 Download "The Role of the Principal"
3 01-Quick-4637.qxd 3/30/ :40 AM Page 5 The Role of the Principal 5 administering the school s budget; admitting and placing students; ensuring that report cards are sent to parents; attending meetings, acting as a resource person at those meetings, considering recommendations, and reporting back on actions taken (or delegating those responsibilities to the vice-principal); developing a safe school environment with the help of parents and the community. ADDITIONAL ROLES AND SKILLS: A QUICK OVERVIEW The following are a few ways to describe the roles and skills required of a principal. 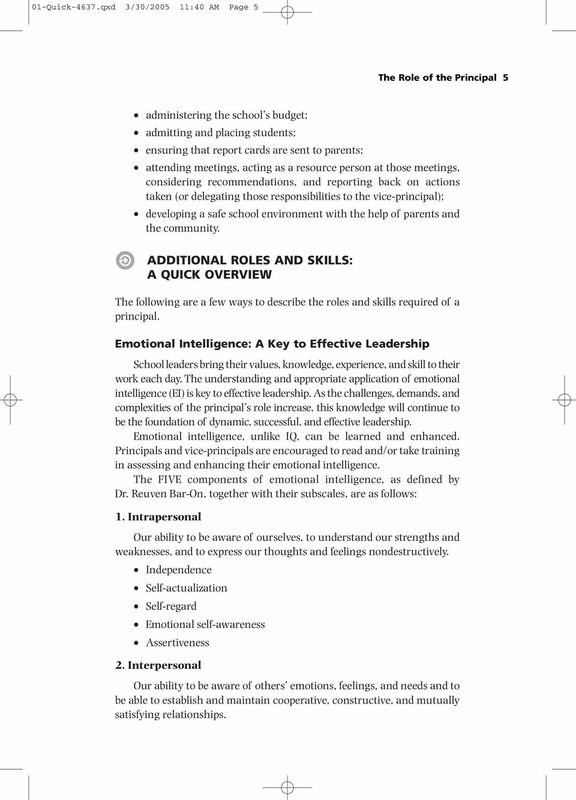 Emotional Intelligence: A Key to Effective Leadership School leaders bring their values, knowledge, experience, and skill to their work each day. The understanding and appropriate application of emotional intelligence (EI) is key to effective leadership. As the challenges, demands, and complexities of the principal s role increase, this knowledge will continue to be the foundation of dynamic, successful, and effective leadership. Emotional intelligence, unlike IQ, can be learned and enhanced. Principals and vice-principals are encouraged to read and/or take training in assessing and enhancing their emotional intelligence. The FIVE components of emotional intelligence, as defined by Dr. Reuven Bar-On, together with their subscales, are as follows: 1. Intrapersonal Our ability to be aware of ourselves, to understand our strengths and weaknesses, and to express our thoughts and feelings nondestructively. Independence Self-actualization Self-regard Emotional self-awareness Assertiveness 2. Interpersonal Our ability to be aware of others emotions, feelings, and needs and to be able to establish and maintain cooperative, constructive, and mutually satisfying relationships. 5 01-Quick-4637.qxd 3/30/ :40 AM Page 7 The Role of the Principal 7 3. Climate builder 4. Communicator 5. Motivator 6. Negotiator 7. Organization developer 8. Planner 9. Researcher 10. Professional leader SOURCE: Adapted from A New Time A New Schoolhouse Leader, A. J. H. Newberry, pp As Manager 1. 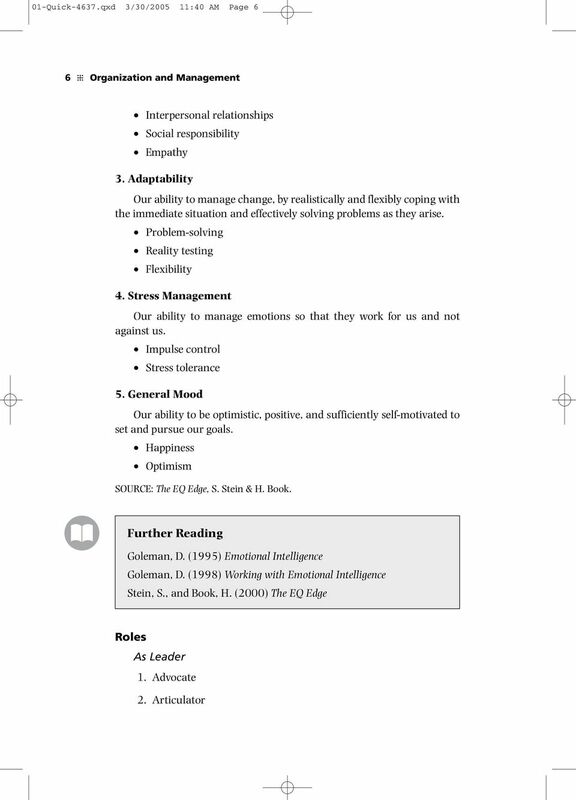 Interpersonal roles: figurehead, leader, liaison 2. Informational roles: monitor, disseminator, spokesperson 3. Decisional roles: entrepreneur, disturbance handler, resource allocator, negotiator SOURCE: Adapted from H. Mintzberg, as quoted in The Rookie Manager, J. T. Straub, Figure 1-1, p. 2. Skills 1. Interpersonal skills: leadership, sensitivity, motivation of self and others 2. 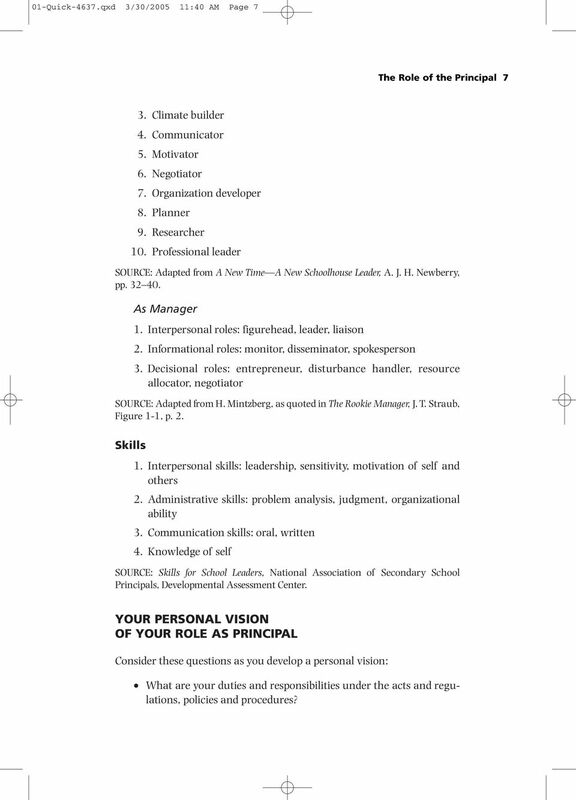 Administrative skills: problem analysis, judgment, organizational ability 3. Communication skills: oral, written 4. Knowledge of self SOURCE: Skills for School Leaders, National Association of Principals, Developmental Assessment Center. 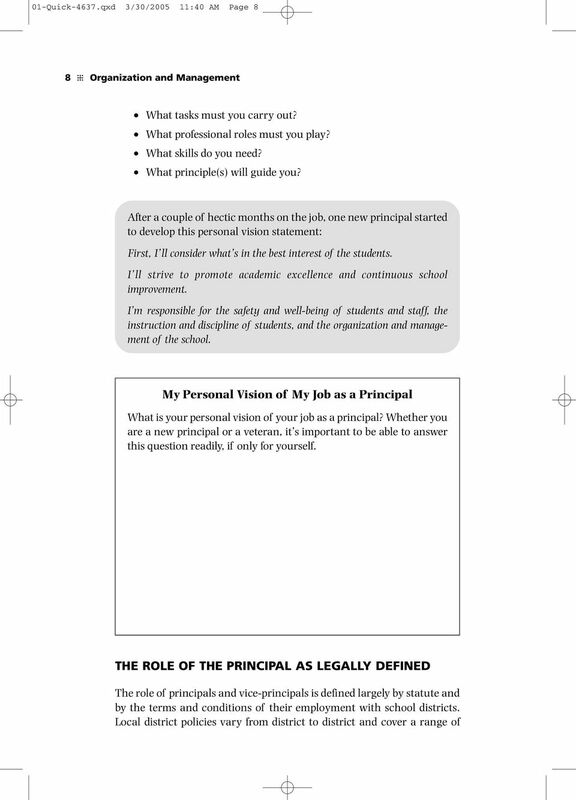 Secondary School YOUR PERSONAL VISION OF YOUR ROLE AS PRINCIPAL Consider these questions as you develop a personal vision: What are your duties and responsibilities under the acts and regulations, policies and procedures? 7 01-Quick-4637.qxd 3/30/ :40 AM Page 9 The Role of the Principal 9 topics. Although relevant statutes and regulations are reasonably precise in their imposition of duties and responsibilities, the documents describing terms and conditions tend to refer vaguely to a principal s responsibility to enforce and abide by district policy. 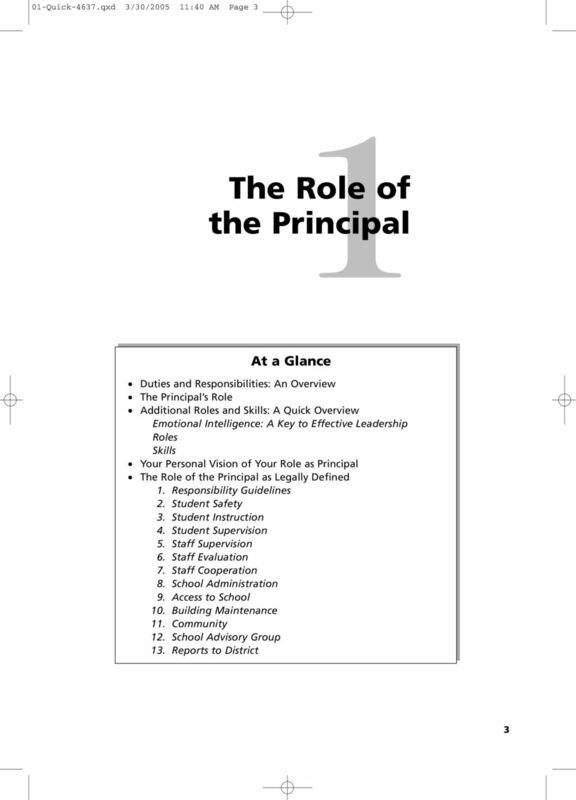 Set out below are various categories of principal and vice-principal responsibilities. Some duties relate to more than one category and so are reproduced in more than one section. This document is intended to provide an overview only, and does not purport to be all-encompassing. Please note that the acts and regulations are constantly changing. 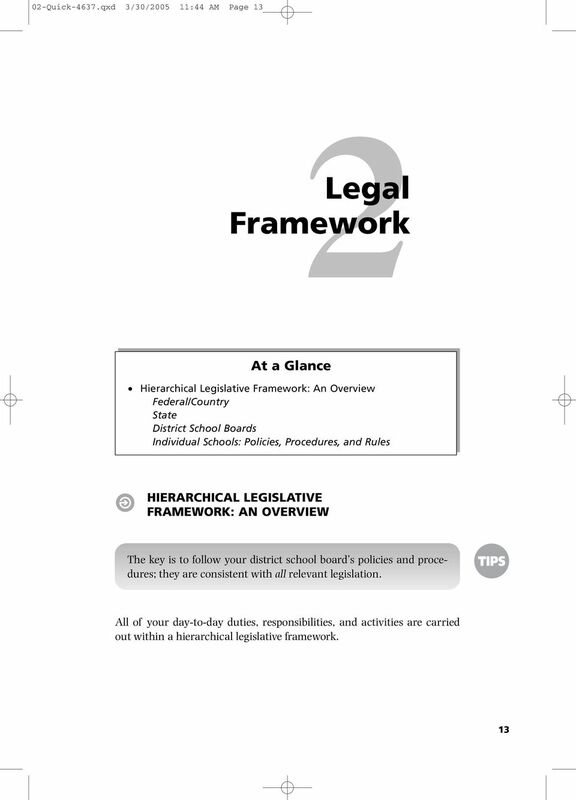 Be sure to keep yourself up-to-date with all changes in statutes and the resulting revisions to district policies and procedures. 1. Responsibility Guidelines a. Maintain order and discipline in the school. b. Be responsible for the instruction and the discipline of students in the school. c. Report promptly any neglect of duty or infraction of school rules by student to parent. 2. Student Safety a. Ensure that all reasonable safety procedures are carried out in courses and activities for which the teacher is responsible. b. Report to the appropriate agency when there are reasonable grounds to suspect child abuse. c. Ensure care of students and property. 3. Student Instruction a. Supervise instruction in the school. b. Obtain permission to evaluate students. c. Arrange for home instruction for students in appropriate circumstances. 4. Student Supervision a. Ensure supervision of students when the school buildings and playgrounds are open. 8 01-Quick-4637.qxd 3/30/ :40 AM Page Organization and Management b. Ensure supervision of students during the conducting of any school activity. c. Ensure that teachers carry out the supervisory duties and instructional program assigned by the principal and supply such information as the principal may require. 5. Staff Supervision a. Supervise the instruction in the school. b. Assign duties to the vice-principal. A vice-principal shall perform such duties as are assigned by the principal. In the absence of the principal of a school, a vice-principal, where a vice-principal has been appointed for the school, shall be in charge of the school and shall perform the duties of the principal. c. Administratively supervise psychiatrists, psychologists, social workers, and other professional support staff where such persons are performing their duties in the school. d. Assign duties to vice-principals and teachers in charge. 6. Staff Evaluation a. Conduct performance appraisals of new teachers as mandated by district contract. b. Conduct performance appraisals of all teachers as mandated by district contract. 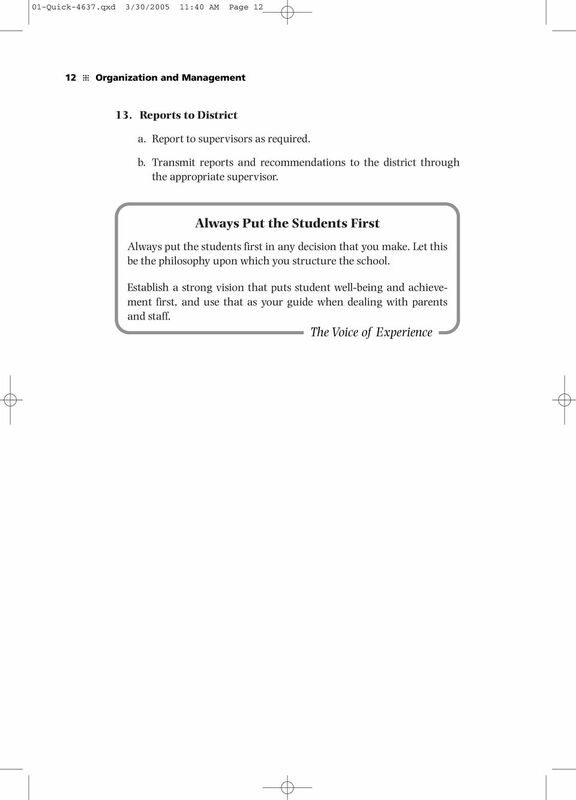 c. If a performance appraisal is unsatisfactory, the principal must (i) document concerns; (ii) consult regularly with his or her supervisor regarding the teacher s performance and steps that may be taken to improve it; and (iii) provide feedback and recommendations to the teacher to help improve the teacher s performance. 7. Staff Cooperation a. Ensure that principals and teachers display personal and professional qualities. b. Establish and maintain mutually respectful relationships with students, staff, and parents. 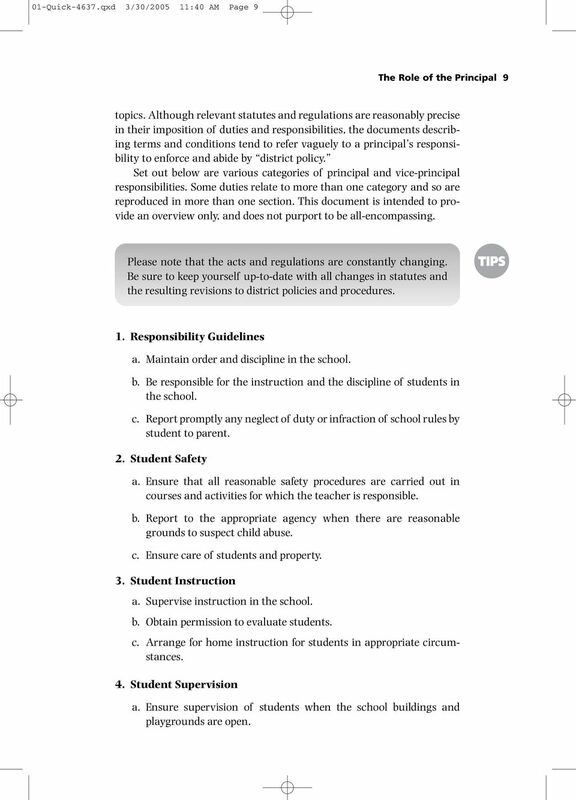 9 01-Quick-4637.qxd 3/30/ :40 AM Page 11 The Role of the Principal School Administration a. Maintain student records including attendance. b. Examine all data in a timely manner. c. Enforce all local policy and codes of conduct. 9. Access to School a. Monitor visitors into the school (i.e., visitor s book). b. 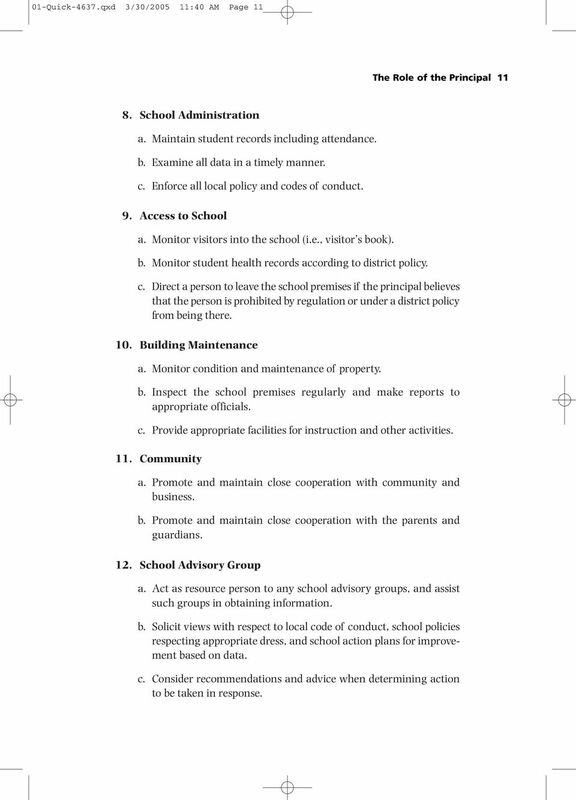 Monitor student health records according to district policy. c. Direct a person to leave the school premises if the principal believes that the person is prohibited by regulation or under a district policy from being there. 10. Building Maintenance a. Monitor condition and maintenance of property. b. Inspect the school premises regularly and make reports to appropriate officials. c. Provide appropriate facilities for instruction and other activities. 11. Community a. Promote and maintain close cooperation with community and business. b. Promote and maintain close cooperation with the parents and guardians. 12. School Advisory Group a. Act as resource person to any school advisory groups, and assist such groups in obtaining information. b. Solicit views with respect to local code of conduct, school policies respecting appropriate dress, and school action plans for improvement based on data. c. Consider recommendations and advice when determining action to be taken in response.